Heavy rains and hailstrom accompanied by strong winds lashed the national capital Thursday, bringing the mercury down by four to five notches and causing several flights to be diverted to nearby cities. Operations at the Delhi airport saw massive disruption as 38 flights had to be diverted between 6 pm and 8.45 pm, and several others faced delays of over two hours due to unfavourable weather conditions. Operations of smaller aircraft such as the Bombardier and the ATR were suspended for a while due to strong winds but resumed later, airport officials said. The Safdarjung observatory, whose reading is considered the official figure for the city, recorded 4.8mm rainfall between 8.30 am and 8.30 pm. Rains continued even after that but figures for the same were not available. Palam recorded 3.2mm rainfall, Lodhi Road 3.8mm, Ridge 3.4mm, Ayanagar 4mm, Gurgaon 3mm, Jafarpur 9mm, Najafgarh 3mm and Sports Complex recorded 2mm of rain between 8.30 am and 2.30 pm. The humidity level oscillated between 100 and 89 per cent. 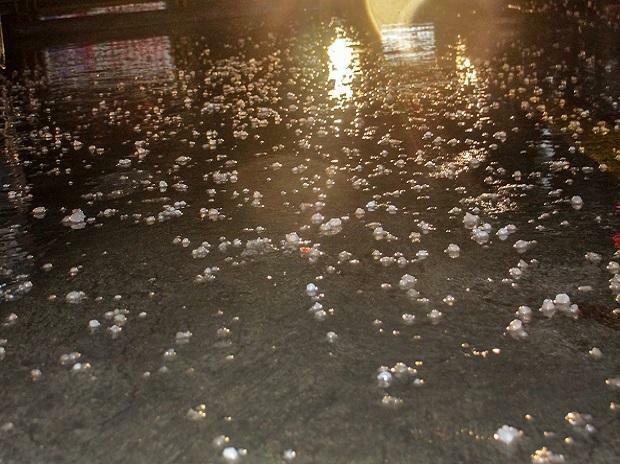 Hailstorms hit several parts of Delhi and its adjacent areas. Excited people took to social media to share pictures of roads covered with hail. The weatherman has forecast shallow to moderate fog for Friday morning and mainly clear skies during the day. The maximum and minimum temperatures is expected to hover around 19 and 10 degrees Celsius respectively. The minimum temperature on Wednesday was 12 degrees Celsius, while the maximum settled at 24 degrees Celsius.